Ingolstadt/Geneva, March 7, 2017 – Reaffirming its status as the indisputable head of the A5 pack and a cornerstone of the Audi Sport stable, the all-new RS 5 Coupé makes its world debut at the 87th annual Geneva Motor Show this week, delivering phenomenal pace from its brand new V6 biturbo TFSI, a lighter overall weight and a healthy hike in torque. The very latest in Vorsprung durch Technik is also comes to the fore, from the cutting-edge driver assistance and connectivity systems to the even more comprehensive specification as standard. Ordering for the 450PS, sub-four second gran turismo is expected to open from May this year, ahead of first examples reaching UK roads this summer. “The new Audi RS 5 Coupé is the gran turismo among the RS models from Audi Sport. The high-performance Coupé combines elegant aesthetics with high everyday usability. 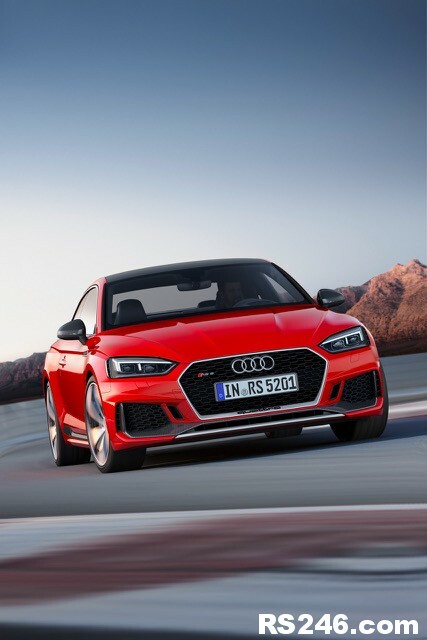 The car’s V6 biturbo has been developed from the ground up and provides significantly more performance coupled with higher efficiency,” said Stephan Winkelmann, CEO of Audi Sport GmbH, in describing the new model. 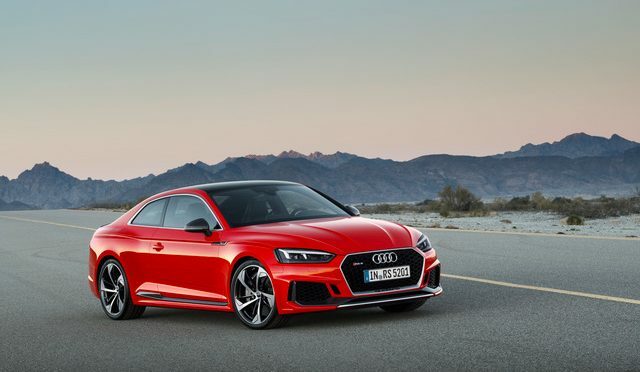 The RS 5 Coupé is also the first car to bear the new Audi RS design idiom that will be introduced to the Audi Sport range. The designers drew inspiration for the RS 5 Coupé from the distinctive racing details of the Audi 90 quattro IMSA GTO. Massive air inlets with the honeycomb structure typical of RS models characterise the front end of the new Audi RS 5 Coupé. The Singleframe radiator grille is much wider and flatter than in the base model. Next to the headlights are additional lateral air intakes and outlets; tinted bezels differentiate the optional Matrix LED headlights. quattro blisters on the flanks emphasise the pronounced bulges over the wheel arches, which have been widened by 15 millimetres. Two turbochargers are positioned centrally between the cylinder banks of the 2.9 TFSI unit. The ingested air flows to the respective turbocharger and into the combustion chambers through a dual-branch system for spontaneous response. The B-cycle combustion process with central direct injection represents a new level of efficiency among the RS models. The shortened compression stroke used here enables an engine process with a significantly higher geometric compression ratio. Combined with a power stroke that, while normal, is longer relative to the compression stroke, this allows for more efficient combustion and increased engine efficiency. According to the NEDC, the V6 biturbo is capable of up to 32.5mpg combined, corresponding to 197 grams CO2 per km – an efficiency gain of 17 percent over the previous model. Another factor in the greater efficiency of the new RS 5 Coupé is its significantly lower weight. It tips the scales at 1,655 kilograms, 60 kilograms less than before. A carbon roof with a visible fibre structure is available as an option. The biturbo’s power flows through a dynamically-tuned, eight-speed tiptronic with optimised shift times to the quattro permanent all-wheel drive. The drive forces are distributed asymmetrically to the axles (40:60) to guarantee dynamic handling with optimal traction and the greatest possible safety. Audi Sport also offers a rear sport differential. An updated five-link construction is used on the front axle. At the rear, a five-link suspension replaces the trapezoidal-link suspension used on the previous model, benefiting the deft driving characteristics and agility. It also improves comfort significantly. 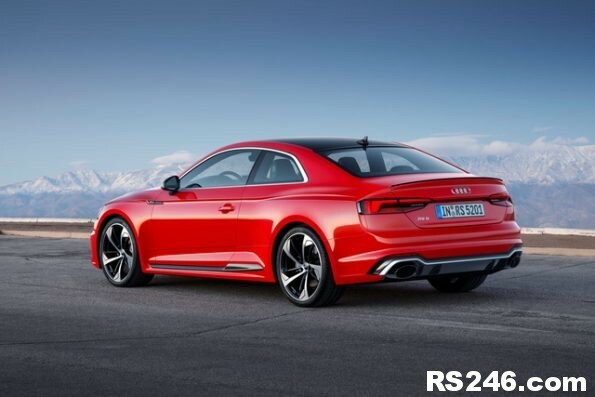 With the standard RS sport suspension, the new Audi RS 5 Coupé sits much lower than the production model. Audi Sport also offers the RS sport suspension with Dynamic Ride Control (DRC), ceramic brakes and dynamic steering with RS-specific tuning. Drivers can make their personal driving experience more individual, dynamic or comfortable using the standard Audi drive select system. 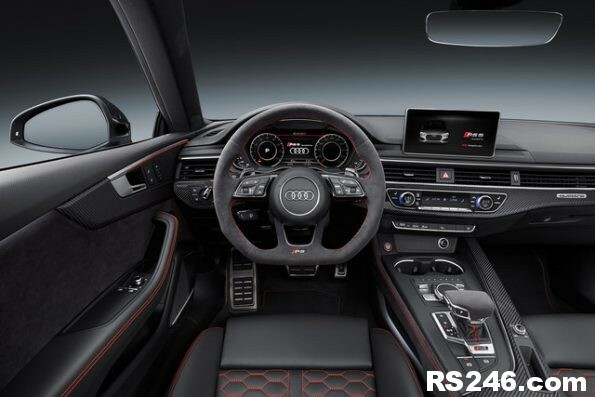 Bathed in black, the interior of the new Audi RS 5 Coupé is extremely upscale and lavishly appointed. Details such as RS sport seats with optional diamond stitching in Fine Nappa leather and the flat-bottomed RS multifunction sport steering wheel underscore the character of the high-performance coupe in the interior as well. RS logos adorn the seats, steering wheel, door sill trims and the selector lever. Special RS displays in the Audi virtual cockpit provide information on tyre pressure, torque and g-forces. A shift light prompts the driver to upshift upon reaching the rev limit. The RS design package uses red as a vibrant contrasting colour. Package highlights are the steering wheel, selector lever and knee pads in Alcantara plus seat belts contoured in red and floor mats with the RS emblem. Audi Sport offers Sonoma green metallic as an exclusive paint finish for the RS 5 Coupé. A comprehensive range of infotainment choices is sure to keep everyone on board entertained. The optional MMI navigation plus with MMI touch includes the hardware module Audi connect, which connects the new RS 5 Coupé to the internet via LTE. Thanks to the Audi connect SIM, which is permanently installed in the car, the flat rate data package for the connect services including Europe-wide roaming is free of charge for three years. Passengers can go online with their mobile devices via the Wi-Fi hotspot option. The Audi smartphone interface uses Apple Car Play and Android Auto to make selected apps available in a separate MMI menu. Control is easy and intuitive, thanks to natural language voice control, free text search and the multifunction steering wheel. The touchpad in the centre console is used to zoom, scroll and enter characters. Further high-end technologies, such as the head-up display and as many as 30 driver assistance systems enhance safety, comfort and efficiency. The intelligent interplay between these systems represents another step on the road to piloted driving. Over 13,000 units of the first-generation Audi RS 5 Coupé have been delivered to customers since 2010. The RS 3 Sportback – the original entry point to Audi RS ownership – has taken a back seat recently to allow the new RS 3 Saloon its share of the limelight, but at next month’s Geneva Motor Show the muscle-bound five-door will make its comeback emboldened by the latest 400PS five-cylinder TFSI engine and a raft of design and connectivity upgrades. Following its world public debut in Switzerland on Tuesday March 7 the Audi compact segment spearhead will become available to order in the UK in the summer and will touch down here towards the end of the year. 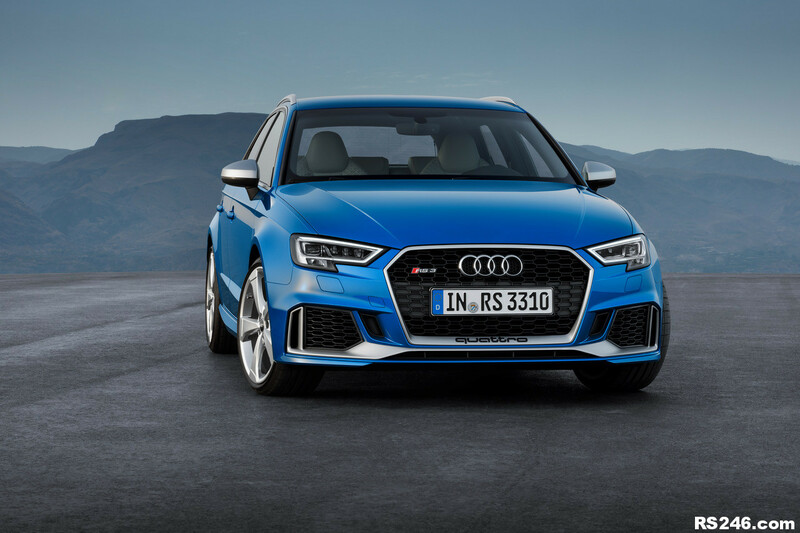 Behind the impressive performance of the Audi RS 3 Sportback is the world’s most powerful production five-cylinder engine – the 2.5 TFSI. It delivers 400PS – 33PS more than its predecessor – and is 26 kilograms (57.3 lb) lighter thanks to its aluminium crankcase, among other features. Its maximum torque of 480 Nm (354.0 lb-ft) is available from just 1,700 rpm and remains at the driver’s disposal right through to 5,850 rpm. This wide tract of torque facilitates an exhilarating 4.1-second 0-62mph sprint time, the effect of which is heightened by the five-cylinder unit’s unmistakably full-bodied and characterful sound. Top speed is limited to 155mph, but if the optional dynamic package plus is specified a de-restriction to 174mph is among the extra features it brings. For better mixture preparation, the new 2.5 TFSI engine employs dual injection into the intake manifold and into the combustion chambers. On the exhaust side, the Audi valvelift system controls the duration of valve opening depending on the throttle and engine speed – for moderate fuel consumption at low and partial load as well as optimal throttle response and a high level of tractive power at full load. 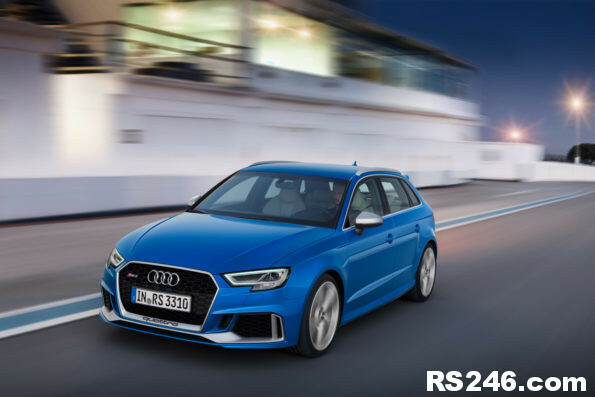 In the New European Driving Cycle (NEDC) test the RS 3 Sportback returns 34.0mpg – a creditable figure considering its performance capabilities which equates to 189 grams of CO2 per kilometre. The proven channels for the mighty engine’s output are the S tronic seven-speed dual-clutch transmission and quattro permanent all-wheel drive based on an electro-hydraulic multi-plate clutch which distributes the drive torque variably between the axles. The share it allocates to the rear axle automatically varies depending on speed and cornering forces, but its bias can also be influenced by the driver using the standard Audi drive select system, which can also influence the response of the steering, transmission, engine management, adjustable exhaust flaps and optional RS sport suspension with adaptive damper control. It offers three modes – comfort, auto and dynamic. Cornering attitude is also further enhanced by the Electronic Stabilisation Control (ESC) with wheel-selective torque control and the sport mode specially tuned for the RS. 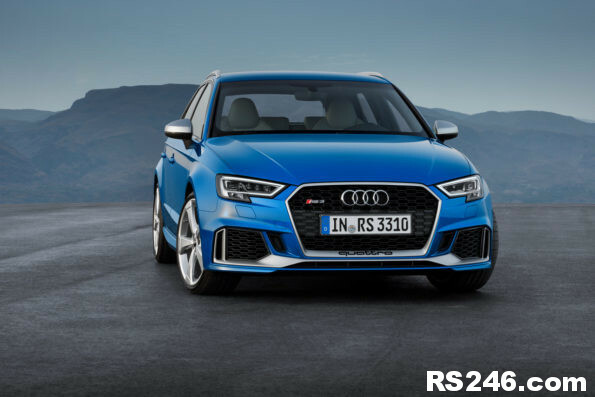 With its standard progressive steering and sophisticated multi-link suspension with wider front track positioning the stocky body 25mm lower than the A3, the RS 3 Sportback is set up to deliver compelling grip and adjustability with extraordinary poise. 19-inch alloy wheels framing 310-millimetre brake discs front and rear are factory fitted, and as an alternative customers will be able to choose carbon-fibre ceramic front discs. Externally, the flared front arches that evocatively link the RS 3 Sportback with its Eighties quattro coupé forebears continue to lend just the right air of power and purpose to the latest car, while subtle styling revisions based on the recent updates made across the A3 range also lift its look. The Singleframe grille with its gloss black honeycomb mesh and the large air inlets and angular sill trims which flank it are now also complemented by a redesigned blade in the bumper which serves to make the car appear even more broad-shouldered. At its ends it forms narrow, upright funnels. LED headlights with their distinctive lighting signature are standard, and matrix LED headlights are available from the options list. At the rear an elongated RS roof edge spoiler, a diffuser insert and the RS exhaust system’s large oval tailpipes add further emphasis to the high performance hatchback’s foursquare stance. In the equally focused cabin the two circular instrument dials with their black faces, white scales and red needles sit either side of a driver information system that includes a boost pressure indicator, an oil thermometer and a lap timer. In the latest car this configuration can now be replaced by the fully digital Audi virtual cockpit which is newly available. A special RS screen shifts the tachometer to the centre, displaying on either side the readings for torque, g‑forces and tyre pressure. When the S tronic transmission is operating in manual mode, a scale with a colour background prompts the driver to use the steering wheel paddle or selector lever to upshift when approaching maximum rpm. Sport seats with RS seatback emblems in black fine Nappa leather are standard, and for even greater support RS sport seats with more contoured profiles and integrated head restraints for the driver and front passenger are available as options. The RS sport leather steering wheel is flat-bottomed and features buttons for operating the infotainment system. The main control element is the rotary/push-button control on the console of the centre tunnel. A touchpad can be integrated in its surface, enabling the driver to scroll, zoom and enter text. Also included is a free text search feature that automatically completes the user’s input after just a few letters have been entered. The voice control can process user questions and commands formulated in everyday language. 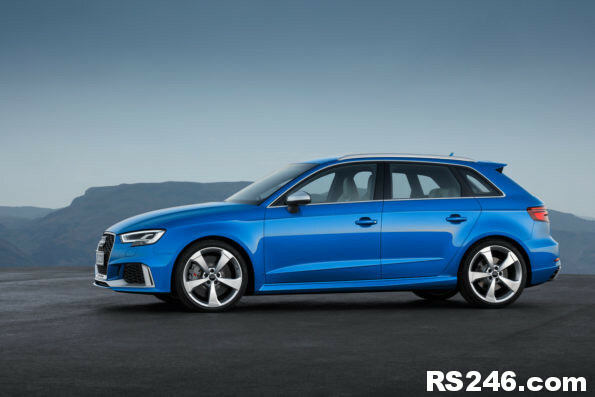 When it comes to infotainment, the RS 3 Sportback is even more versatile than before. The Audi Smartphone Interface is now standard, enabling users to access selected apps on their handsets from the car’s onboard monitor via Apple Car Play and Android Auto, and an LTE module brings the Audi connect services on board, including navigation with Google Earth and Google Street View, as well as information on fuel prices, weather, travel and traffic. The Audi MMI connect app lets users transfer their smartphone calendars into the MMI system. Drivers can also send destinations from Google Maps and special destinations to the navigation system, and also stream music from the internet. In addition, the navigation system includes a Wi-Fi hotspot that enables passengers to connect their mobile devices to the internet. Other highlights include the Audi phone box for wireless connection to the car’s onboard antenna and inductive charging of handsets equipped to the QI standard, the Bang & Olufsen Sound System with 705 watts of power, and many driver assistance systems. In slow-moving traffic up to 40mph, for example, the traffic jam assist keeps the car at a safe distance from the vehicle in front and can briefly take over the steering. Also new in the Audi RS 3 Sportback are the emergency assist, which automatically stops the car if required, and cross traffic assist rear. The latter system looks out for crossing vehicles when the driver is pulling out of a parking space. Orders for the RS 3 Sportback and the RS 3 Saloon will be accepted in the UK from the summer, and UK pricing for both variants will be confirmed closer to that point. 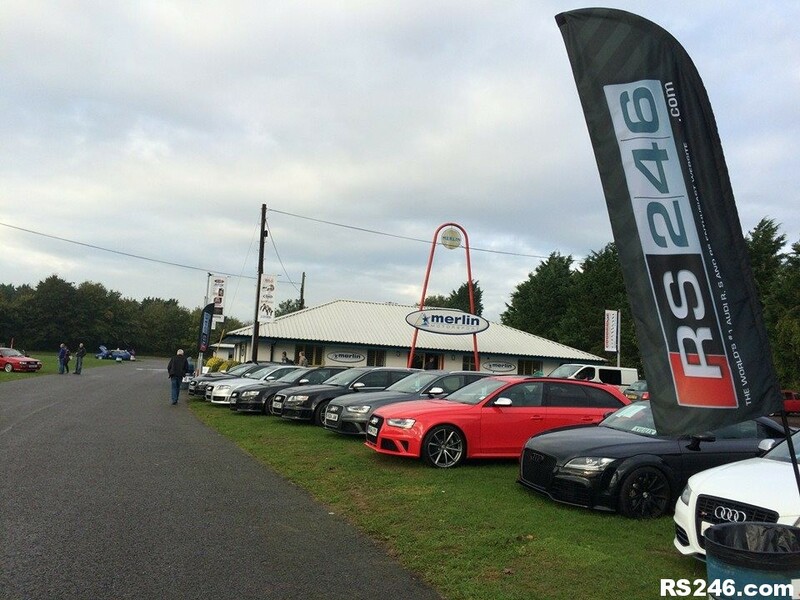 Check out this cool video of our members at Audi Driver International 2016 at Castle Combe. Credit to FaisalJ for capturing the moment and creating the video. More pics and discussion in our Trackdays and Meets section. Amazing technology allowing a 360° view of a lap of the Nordschleife Nürburgring in an Audi R8 V10 Plus Selection 24h special edition. From today devotees of the gloriously vocal ten-cylinder engine at the heart of the all-new Audi R8 will be able to revel in the roar even more completely by opting for the latest open-air R8 Spyder. Priced from £129,990 OTR, the new addition to the second generation R8 range can convert to sun-seeking mode in just 20 seconds, leaving occupants to enjoy the elements to the increasingly rare tune of a naturally aspirated V10 soundtrack. The basic format may be familiar, but the ground-up rework of the R8 Spyder brings it very much up to date not only by adding more power and a 50 per cent uplift in torsional rigidity, but also sophisticated new features including the fully digital Audi Virtual Cockpit, the Audi smartphone interface and internet-based Audi Connect services. The key point of differentiation between Coupe and Spyder R8 models is of course the lightweight, fully automated cloth hood, which can be activated at speeds of up to 31mph and is slickly concealed beneath the sculpted integral cover, or reattached to shield occupants from a sharp shower, in just 20 seconds. The rear window, sunk into the bulkhead, can also be retracted and extended at the touch of a button. The strong backbone of the new R8 Spyder is the newly developed multi-material Audi Space Frame (ASF) which incorporates an intelligent mix of aluminium and carbon fibre that helps to keep dry weight down to just 1,612kg. The inherent strength of the concept is evident in the fact that torsional rigidity has increased by over 50 per cent compared with the previous model, helped by Spyder-specific body reinforcements primarily in the sills, A-pillars and windscreen frame. To propel this light yet impressively rigid shell as effectively and efficiently as possible, the latest naturally aspirated V10 works with a fast-acting seven-speed S tronic transmission and a newly designed quattro drive system using an electro-hydraulically activated multi-plate clutch apportioning drive fully variably to either axle according to the situation. The upgraded power plant adds advanced features such as dual injection to optimise response and a freewheeling mode which enables it to ‘decouple’ whenever possible to improve fuel economy. 540PS of power and 540 Nm (398.3 lb-ft) of torque at 6,500 rpm deliver phenomenal road performance, with the 0 to 62mph sprint taking just 3.6 seconds on the way to a top speed of 197mph, but the latest R8 Spyder is also capable of returning up to 24.1mpg, corresponding to 277 grams CO2 per kilometre. The Audi drive select adaptive dynamics system is standard, and offers four modes ranging from overtly dynamic to comfort-oriented. Even greater fine-tuning is available via the optional R8 performance leather steering wheel with its multifunction and satellite controls, one of which provides access to three more driving programs: dry, wet and snow. These match the car’s operating characteristics to the specific conditions of the road being travelled. Another new highlight in the driver’s field of vision is the large 12.3-inch, fully digital Audi virtual cockpit, which presents all information using rich 3D graphics. 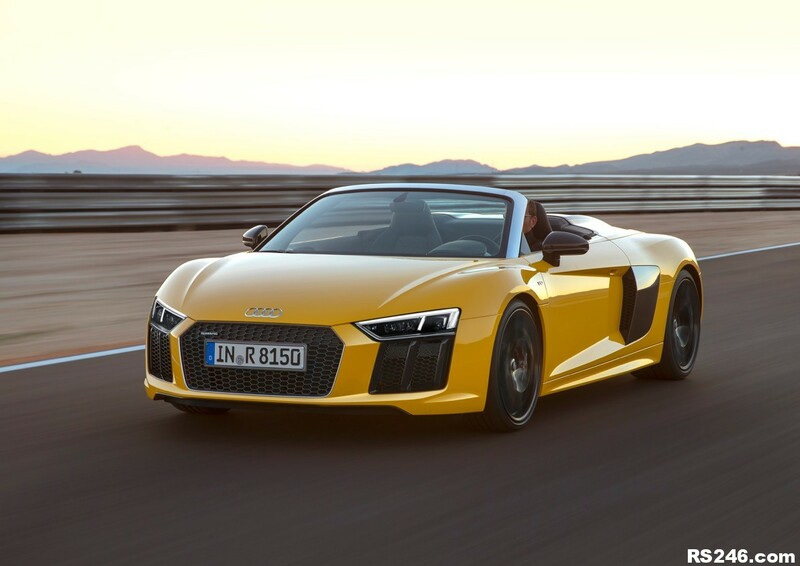 The internet-based services delivered by Audi connect come as standard in the R8 Spyder, as does the intuitively operated MMI navigation plus with MMI touch, the Audi Music Interface and belt microphones which make it even easier to use natural-language voice control and the phone. The Audi smartphone interface, which made its debut in the Q7 and A4 model lines and has just become a standard feature of the A3, is also adopted by the second generation R8 Spyder. It enables selected content from compatible iOS and Android smartphones to be displayed by the Audi virtual cockpit. The Audi phone box can also be specified to connect mobile phones to the car aerial and charge them inductively, and for audiophiles the optional Bang & Olufsen Sound System now also plays through two loudspeakers mounted in each seat’s headrest, for outstanding sound quality even when driving with the hood down. Over and above the extensive standard equipment, customers have almost unlimited scope to tailor both the interior and exterior to their individual preferences with features such as Gloss carbon exterior detailing, LED headlights with laser technology and a wealth of Audi exclusive upholstery and trim upgrades. Drivers keen to wring every last ounce of reward from their R8 can also opt for the Sport Plus Pack, which adds even more responsive, variable ratio dynamic steering, Audi magnetic ride adaptive damping and an even more aurally impactful sport exhaust identifiable by black exhaust tailpipes which replace the standard chrome examples. Ultraviolet delight – The all-new 197mph Audi R8 Spyder is now available, combining the many advances made by the latest Coupe with added open-air intensity for an OTR price starting at £129,990.